Complete Shangri-La Shades Buying Guide from BlindsOnLine.com - BlindsOnLine.com Inc. In his 1933 novel Lost Horizon, author James Hilton coined the name "Shangri-La” to describe the earthly paradise where the immortal Himalayan people of the Kunlun Mountains lived. In this mystically fictitious Eden, the people of Shangri-La lived in a constant state of happiness and had everything they could ever desire, except freedom from permanent isolation. Aptly named, the versatile, light-changing Shangri-La shades (more colloquially referred to as horizontal shades) give the bedroom a similar blissful comfort to what the characters in James Hilton’s story enjoyed. In recent years, more and more customers have been purchasing horizontal shades because of their many features and advantages over other window treatments. What Are the Benefits of Horizontal Shades? Horizontal shades can hide any visible hardware because they come with a head rail as well as fabric to provide a totally unobstructed view from your window. 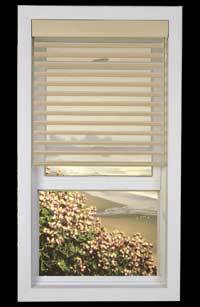 Engineered with a pulley and sliding weight system, these shades were designed for easy use and adjustments. Once Shangri-La shades are installed they can be maintained in good condition for many years with routine cleaning. To clean the fabric, vacuum at a low setting or use a feather duster. These shades also allow you to decide precisely how much light filters in – if any at all. When opened, horizontal shades let natural outdoor light softly trickle into the room; when closed they function like drapes or shades, keeping light completely out. In addition to their other useful benefits, Shangri-La shades are different from any other shades on the market because they can be raised even when vanes are still open. Once you purchase horizontal shades you are on your way to experiencing all of the benefits they have to offer. But first you must install them onto your windows. 1. Whether you are a novice DIYer or an experienced decorator, it is always importance to err on the side of caution; always read instructions and put on safety goggles before starting any work. 2. As far as tools go, you will need a pencil, a tape measure, some flat and Philips screws, drivers, a level, and a hex head. 3. One of your first tasks should be to determine whether you prefer an inside mount or an outside mount as each has different mounting process. 4. If you are not an experienced professional and you do not know what you’re doing, it may be better to find a local company to install your shades for you. If you still prefer to do it by yourself, be sure to read and follow all installation instructions meticulously. What Are the Different Horizontal Blind Options Available from BlindsOnLine.com? Shangri-La shades are made of 100% polyester, can fit a range of different window sizes and come in 4 different colors. Because of their clean and simple, yet classic look, horizontal shades are becoming and exceedingly popular window shade option for both homes and offices. At BlindsOnLine.com, all of our shades come with the proper mounting equipment which usually ship within 5 days of the purchase. Armed with the above knowledge, you can decide for yourself whether or not Shangri-La shades are the right product that you are looking for. Browse the BlindsOnLine.com inventory today to find your perfect window treatment and place an order!